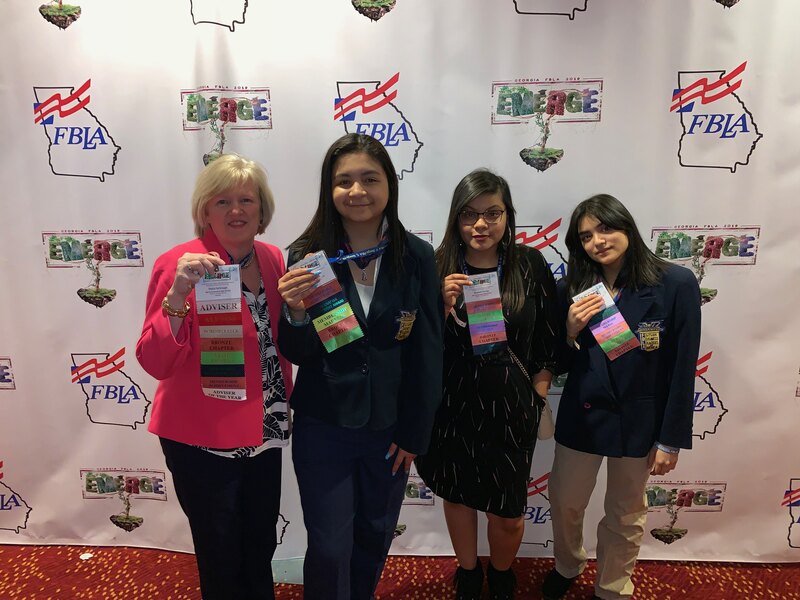 Three Morris Innovative High School members of Future Business Leaders of America attended the state leadership conference in Atlanta March 22-24. The members that attended were Elizabeth Cornejo, Jessica Jacobo and Hadley Sanchez with advisor Sheila Yarbrough. The students received ribbons for their activities that they participated in FBLA over the course of the year. Some of the ribbons represented recruitment awards, having a 50 member club, the Membership Achievement Award from surpassing their membership from one year ago, getting points for the state project and receiving Chapter of the Year Bronze Award. The students were recognized at the awards ceremony with a plaque for Chapter of the Year, bronze level, for obtaining more than 750 points with FBLA in the past year. The students enjoyed networking with 3,000 other FBLA students from across the state and learning from the many conference workshops. Elizabeth Cornejo said, "I felt like I learned a lot and found out at one of the workshops on the different types of leaders that I am an autocratic leader because I am so direct with people." The students and advisor also enjoyed a trip to the World of Coke to experience the company's international business strategies. "It was impressive to be able to taste over 100 different flavors of coke from around the world," said Jessica Jacobo. All of the girls said they appreciated the opportunity to attend the conference, learn how to be a better leader in the future and how to communicate with others.